The University of New Mexico School of Medicine prides itself on its evolving curricular innovations which are aimed at adapting adult learning theory to medical education. The structure of the curriculum reflects the shift in emphasis from solely learning facts to teaching students the skills they will need to be effective lifelong learners. Current educational initiatives are aimed at fostering the integration of the basic sciences and clinical medicine, early exposure to patients and communities to enhance teaching and learning, progressive development of clinical reasoning skills through a problem-based approach, emphasizing professional identity formation, and attention to personal and professional wellness. Phase I: The first 18 months that focuses on a core basic science education and its relevance to and integration with clinical reasoning and clinical skills development. Basic science content is organized primarily into organ system blocks that allows for the integration of normal structure and function with specific pathophysiology. Competency exams are administered throughout Phase I and assess basic science block content, as well as ethics, professionalism, clinical skills, clinical reasoning and communication skills. Phase II: 12 months that comprise the required clinical clerkships in Family Practice, Internal Medicine, Neurology, Obstetrics and Gynecology, Pediatrics, Psychiatry and Surgery. Professional identity formation continues in Phase II with special topics relevant to the clinical phase of training. Phase III: The final 12 months that includes clinical and non-clinical electives, a required sub-internship, ICU rotation, and an ambulatory and community-based clinical experience. The Health of NM Block focuses students on the major health problems in New Mexico and the social determinants of these problems. Students learn the history of the efforts to improve health in New Mexico and how individual clinicians and the medical school have developed innovative approaches to target health problems at the population level. Teams of students apply this knowledge by creating and presenting a problem analysis of a specific major health problem, and a specific intervention that partners physicians with community groups to reduce this problem. Foundations of Medical Science is a 10-week block that focuses on the genetic, molecular and cellular principles that form a foundation for the study of the organ systems during the subsequent Phase 1 curriculum. In addition, this course integrates concepts of pathology, immunology, and pharmacology as the basis for understanding human disease. The block is intended to convey the excitement and challenges of the intersection between rapidly evolving advances in our understanding of the molecular and cellular basis of disease with modern medical practice. The Musculoskeletal, Skin and Connective Tissue Block is a 6-week block that focuses on an overview of basic anatomical concepts, the normal anatomy and development of the musculoskeletal system, structure and function of the skin and the pathophysiology of disorders effecting these systems. The course will present an integrated approach using large and small group learning, laboratories and independent learning. The Hematology Block is a 3-week block that focuses on an overview of basic principles of hematology and hemostasis. This course builds on concepts established during Foundations of Medical Science in the consideration of the diseases of the circulating elements of blood. The Neuroscience Block is an 9-week course designed to provide students with a foundation in neurosciences including neuroanatomy, neurophysiology, neuropharmacology, neuropathology and behavioral neurosciences. Basic concepts are learned within the context of neurological and psychiatric disease. The Cardiovascular/Pulmonary/Renal Block is a 10 week block that provides a foundation in the basic sciences of the three organ systems as well as problem-solving skills related to these disciplines. Included in this block are relevant topics in physiology, pharmacology and pathology. The GI/Nutrition/Metabolism/Endocrine Block is an 8-week course that examines the principal biological features of the gastrointestinal (GI) tract, the pathophysiology associated with certain disorders of this system, fundamental concepts of nutrition in maintaining and restoring patient health, metabolic events that regulate energy production and consumption, and the fundamentals of endocrinology and diseases of the endocrine system. The Infectious Disease Block is a 6-week course designed to give students an understanding of the basic concepts of microbiology, pathology and pharmacology that can be applied to the understanding of host and pathogen interactions in infectious diseases. The Human Sexuality and Reproduction block is a 3-week block that focuses on the basic science and important clinicopathologic aspects of the human reproductive system. The course will also provide opportunities for discussion of medical aspects of human sexuality and the behavioral, social and population aspects of issues related to human reproduction. An integrated curriculum designed to (1) explicitly model and have students actively engage in the clinical reasoning process during block relevant case discussions, (2) provide structure, guidance and assessment for self-directed learning and information seeking skills, and (3) provide structure and guidance for the skills of critical judgment and medical problem solving. A longitudinal course using a Team-based learning pedagogy that focuses on principles of epidemiology and study design, a basic understanding of biostatistical principles and their application to the analysis of healthcare data and research and the use of evidence-based medicine to inform decisions to promote optimal patient care. Students will be introduced to what it means to be a clinical practitioner, learn the basic techniques that clinicians use to forge the clinician-patient relationship, and learn the communication and examination techniques used to obtain essential information about the patient. They will also learn how to develop a list of patient problems, to begin thinking about how to present their patient findings in both oral and written form. Students are introduced to healthcare in a primary care setting. They will observe and practice evaluations of patients under the mentorship of a primary care physician and develop basic skills in written documentation of the healthcare encounter. Students will compare and contrast the values and roles of different healthcare professions and explore interprofessional collaboration by working in healthcare teams. Students will build skills in communication, teamwork and patient evaluation by deliberate practice in simulated scenarios. They will continue to develop history and physical exam skills related to the diseases presented in the Phase 1 basic science blocks and develop skills in practice-based learning by researching questions that arise in their observation of clinical practice. The Practical Immersion Experience is a 6-week rural community-based clinical preceptorship experience during which students live in the community to which they are assigned. Students will be mentored by a practicing community physician. PIE offers the opportunities to learn in the setting of a clinical practice, using the skills and knowledge acquired during previous lectures, Clinical Reasoning small groups, and clinical and communication skills from Doctoring 1 and 2. Students will integrate basic science and Doctoring skills into the day-to-day life of the practice of medicine, using patients and their problems as the springboard for their learning. PIE also offers the opportunity to observe first-hand the impact of being a physician on one’s own life and lifestyle. Doctoring 4: Equipping your professional toolbox. The focus of this course is for students to build on clinical skills from previous Doctoring courses and to observe and practice focused evaluations of patients related to the concurrent basic science organ system curriculum. Students deliver oral presentations and provide written documentation of the healthcare encounter under the mentorship of primary care physicians. Students participate in the “Healer’s Art” curriculum related to the value of the human dimension of health care, and explore medical ethics through case studies. Building on the exploration of perspectives from Doctoring 2, students reflect on the effect of clinician bias and stereotyping and their own attitudes and perceptions of different groups in society in the context of patient cases related to substance use, geriatrics, and gender identity. The goal of the Transitions block is to assist students in transitioning from the basic science years of the curriculum to the clinical clerkships. 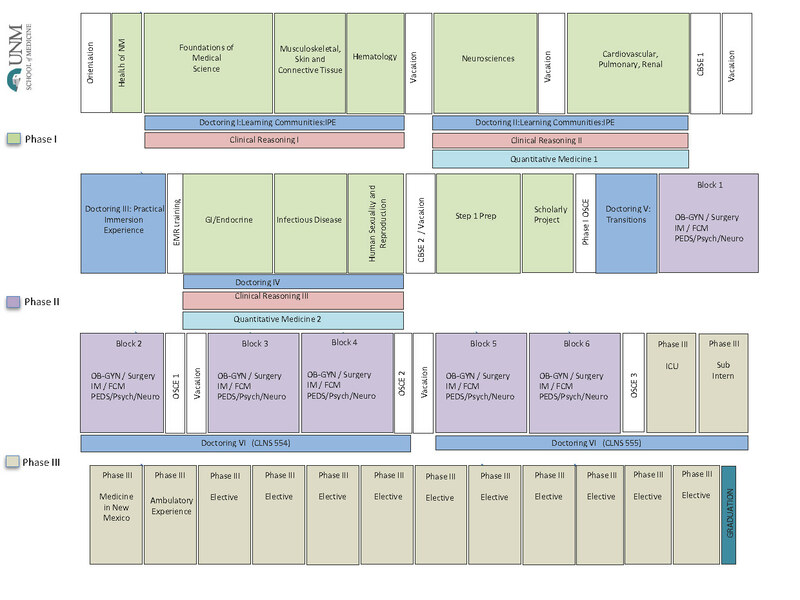 The objectives of the transitions block are accomplished by a combination of specially designed small-group cases, lectures, demonstrations, labs, panels and numerous practical exercises to reinforce the skills needed for future success in the clinical environment. This course builds on prior Doctoring course curricula, encouraging students to apply clinical and communication skills to the practice of medicine, while nurturing their professional identity development and addressing cross-cutting issues that impact patient care and professional life regardless of specialty. Topics include: professional identity formation, Wellness, ethics, substance use, and difficult physician-patient relationships. Scholarship is an important component of the curriculum. Each medical student is required to engage in a faculty-mentored scholarly project, as a requirement for graduation. Designed to help students develop practical skills in the scientific method and understanding of the role of research in informing clinical practice, students will develop and complete a scholarly project in an area of interest related to medical science and/or health care. Students will publicly present or publish their results prior to graduation.